Home Communication Computers Future Gadgets Google Health Ideas Science Smartphones Technology Video Virtual Reality Point Of View: Google Glass As A Surgery Tool Of Future? 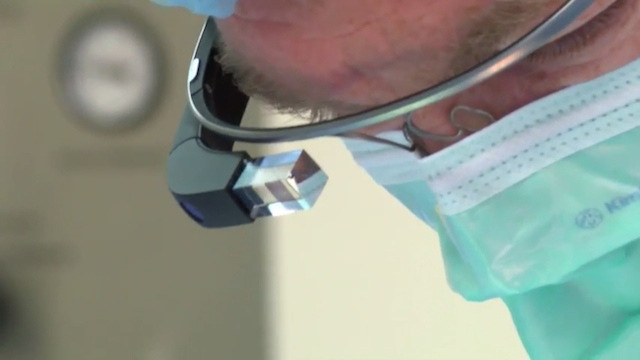 Point Of View: Google Glass As A Surgery Tool Of Future? A surgeon at The Ohio State University Wexner Medical Center is the first in the United States to consult with a distant colleague using live, point-of-view video from the operating room via Google Glass, a head-mounted computer and camera device. Google Glass has a frame similar to traditional glasses, but instead of lenses, there is a small glass block that sits above the right eye. On that glass is a computer screen that, with a simple voice command, allows users to pull up information as they would on any other computer. Attached to the front of the device is a camera that offers a point-of-view image and the ability to take both photos and videos while the device is worn. During this procedure at the medical center’s University East facility, Kaeding wore the device as he performed ACL surgery on Paula Kobalka, 47, from Westerville, Ohio, who hurt her knee playing softball. As he performed her operation at a facility on the east side of Columbus, Google Glass showed his vantage point via the internet to audiences miles away. Across town, one of Kaeding’s Ohio State colleagues, Dr. Robert Magnussen, watched the surgery his office, while on the main campus, several students at The Ohio State University College of Medicine watched on their laptops. Experts have theorized that during surgery doctors could use voice commands to instantly call up x-ray or MRI images of their patient, pathology reports or reference materials. They could collaborate live and face-to-face with colleagues via the internet, anywhere in the world. Only 1,000 people in the United States have been chosen to test Google Glass as part of Google’s Explorer Program. Dr. Ismail Nabeel, an assistant professor of general internal medicine at Ohio State applied and was chosen. He then partnered with Kaeding to perform this groundbreaking surgery and to help test technology that could change the way we see medicine in the future.